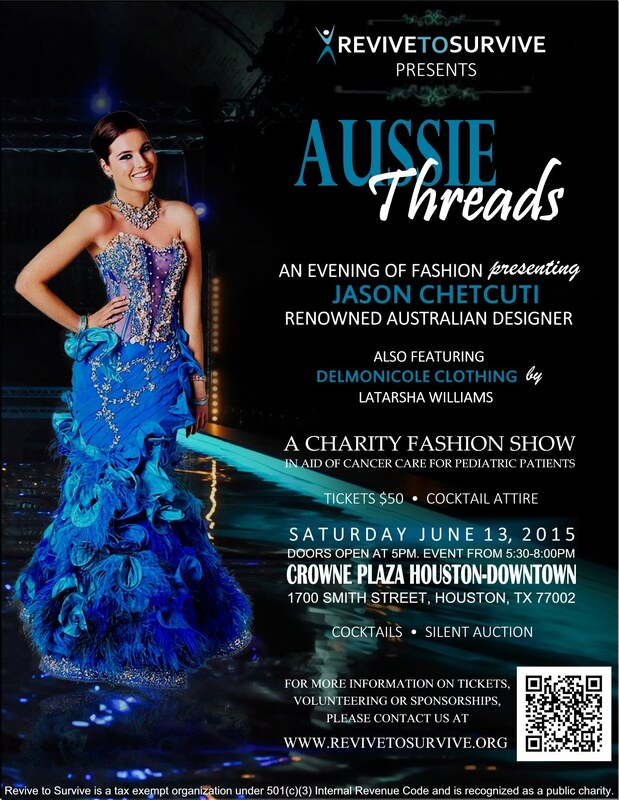 Revive to Survive held its second major fundraiser, “Aussie Threads,” at the Crown Plaza Houston on June 13th, 1015. The highly unique and ambitious event turned out to be a huge success. Dr. Renu Khator, president of the University of Houston, was present at the event and delivered an inspirational speech as our chief guest. The audience was treated to seeing our beautiful models draped in the various fashions and designs of both Australian designer Jason Chetcuti, as well as local Houston designer LaTarsha Williams. Our co-emcees, Corbett Parker and Rachel White, really kept the energy up throughout the night, and Corbett ensured that our live auction was a huge success. The silent auction also proved to be a hit, with many of the items placed for bidding being sold. We were able to raise awareness about our project “Enhance for a Chance,” which aimed to sign up 200 donors to donate $10 a month to enable us to provide lifesaving medications to pediatric cancer patients at the National Cancer Institute, Maharagama, Sri Lanka. Thanks to all the donors, sponsors, and people who attended and helped make this event possible, Revive to Survive was able to raise a total of $32,000! This would have not been possible without all the support we received from both our community the generous hearts that have recently learned of our cause. We thank everyone for their generosity towards the pediatric patients of the Maharagama Cancer Hospital, and we hope that you enjoyed our event and will join us to help these children for many years to come. The dearth of the immune boosting drug, Neupogen (Filgrastim), at the National Cancer Institute (NCI) in Sri Lanka is a serious issue that affects countless underprivileged patients. Due to this persistent need, Revive to Survive decided to embark on an ambitious project, “Enhance for a Chance”, with the goal of providing the entire need of Neupogen (Filgrastim) for the financially destitute cancer patients in the pediatric ward at NCI. This will require a financial commitment of $2,000 per month, a daunting but reachable goal. To kickoff this project, we are embarking on a unique fundraising event, “Aussie Threads”, a dazzling fashion show with cocktails on Saturday, the 13th of June, 2015. Dr. Renu Khator, the President and Chancellor of the University of Houston, will be the guest of honor. The Renowned Australian designer, Jason Chetcuti, has graciously volunteered to showcase his designer collection at no cost to the RtoS. He was truly humbled and impressed by the work done by RtoS and insisted to help the cause by donating his time and services. Jason is a talented designer who designed the dress for the Miss Australia at the Miss Universe pageant in 2012. He has showcased his collection at various Australian fashion shows and is one of the top designers in Australia. The show will also feature an upcoming Houston designer, Tarsha Williams, who will showcase her DelMoniCole Clothing line at no cost to Revive to Survive. Balloon Ride from Soaring Adventures of America Inc.
"Exploring Space - Enhancing Life" poster created by graphic artist Marco Zambetti. Project "Enhance for a Chance" will kick off during the "Aussie Threads" fashion show. Click here for more information or to sign up as a donor for this project. Click here to view the Model Application.